After salt and some kind of acid (citrus, vinegar, and sake), the most important seasoning in the Japanese pantry is umami. While salt enhances the flavor of foods and acids balance those flavors, umami deepens a food’s flavor and adds complexity and sophistication to dishes. Technically, umami is the amino acids found in proteins. That’s why umami’s taste is often described as “savoriness.” But a better way to express umami’s taste and role in cooking is added richness. Umami is naturally present in such foods as seafood, meats, dairy, some types of beans, grains, and nuts, certain seaweeds, and also in many vegetables, including onions, celery, carrots, tomatoes, bell peppers, and mushrooms, among others. Umami is intensified by the cooking techniques of searing, roasting, braising, and stewing and is particularly strong when protein-rich foods are aged and fermented; for example, cured meats, cheeses, and fermented seasonings. All cuisines rely on forms of umami and ways of introducing it into their dishes to improve their flavor. Because the core of Japanese cuisine is seafood, vegetables, and rice prepared using light, quick cooking techniques (raw, blanched, steamed, and stir-fried) that offer up low levels of umami, Japanese cooks have become highly adept at using well-crafted, umami-enriched fermented seasonings to deepen food’s flavors and create a sensation of richness in their dishes. Among these seasonings, the most important is soy sauce. Japanese soy sauce (as opposed to the types of soy sauce made elsewhere in Asia, which are very different seasonings) is the heart of Japanese cuisine’s light, clean tasting yet deeply satisfying food. It gives foods character and dishes a delicious integrating cadence. It is a culinary wonder, not only because it is a pure form of concentrated umami made entirely from plants, but because its other attributes tick all the boxes of great flavor. It is beautifully fragrant, with an appetizing aroma that makes you want to eat—no, crave—food, and it has a saturated reddish-purple color that conveys culinary vitality. It includes notes of sweetness, acidity, and bitterness that balance its saltiness and umami and enhance its overall ability to season foods. As a sauce, it coats foods and extends the food’s flavors by helping them linger in the mouth. Because Japanese soy sauce can completely alter the perception of foods by improving their aroma, color, taste, and mouthfeel without skewing their flavor if used properly, it is ranked as one of Japan’s five chomiryo, or primary seasonings, alongside sugar, salt, acid, and miso—soy sauce’s cousin. All other seasonings are considered koshinryo, or flavorings. A new generation of artisanal Japanese soy sauce brewers are currently making some of the best Japanese soy sauce that has ever been made, creatively combining great ingredients, traditional processes, and modern equipment. This reflects a passion to make high quality products that meet the needs of Japan’s evolving cuisine and to differentiate their products from mass-produced, commercial soy sauce. Ever since the recipe for Japanese soy sauce was developed around 1600, brewing soy sauce has been a big business due to its popularity and widespread use in cooking. Early on, large commercial producers, and even small brewers, began taking shortcuts with the ingredients and brewing process to meet demand and increase profits, well before the 20th century when much of Japanese soy sauce came to be sharp and two-dimensionally salty and savory or was produced synthetically. Today, however, a growing number of artisanal brewers are purists, brewing all-natural soy sauce according to the original recipe of fermenting full-fat soy beans, wheat, water, and sea salt for two summers. They are also reviving the use of large kioke wooden barrels—a key ingredient because of the beneficial and flavorful microbes harbored in the wood—in which to brew their soy sauce. Artisanal soy sauce comes in four basic styles—classic, refined, farmhouse, and specialty. Within each style there are nuanced variations of flavor that reflect the ingredients, the fermentation powers of nature—air, climate, location, and time—and the brewer’s approach and craftsmanship. There are light-, medium-, and full-bodied soy sauces; ones that are balanced, deeply savory, or wild flavored; and others that have fruity, floral, and toasty accents. Specialty products include sweetened, smoked, chunky, crystalized, and flake soy sauce, among others. The wide, nuanced range of flavor profiles available means that artisanal soy sauce can be used to enhance the flavors of all kinds of foods, including fruits and desserts, and enrich every possible cuisine. It can also improve all types of dishes because artisanal brewers typically make one soy sauce specially designed for cooking and another for finishing foods. As a concentrated form of umami, a little soy sauce goes a long way, and it should not be used in cup proportions or doused on food unless you want to mainly taste soy sauce or give your food a strong “meaty” flavor. Instead, it should be used to season dishes as a kakushi-aji, or hidden taste. To make this easier, artisanal brewers are packaging their soy sauce in small bottles—averaging between 100 and 200 millimeters—some of which have droppers. The appropriate way to use it is as a few drops on sashimi and sushi, a splash on tofu and vegetables, and a touch as a condiment for grilled meats. A larger but still modest amount is enough to pickle vegetables, enrich dressings, soups, stews, and braised dishes, create a glaze for roast vegetables and meats, and act as a base for marinades and other sauces. There are also spray and pump bottles that can be used to spritz salads, sandwiches, fruits, and desserts. The possible uses for artisanal soy sauce are endless, and these small, practical containers enable you to buy and experiment with more than one type to help you cook more richly and creatively. They also make it easy to take some with you when traveling because Japan’s artisanal soy sauce has become a truly global seasoning. The revolutionary development of Japanese soy sauce in the late 16th century was enabled by the near simultaneous development of large wooden barrels, called kioke, in which to brew soy sauce. Woodblock print by Utagawa Hiroshige III of soy sauce brewing during the Edo period (1603-1868) . The evolution of soy sauce in Japan has a long history. It is the classic Japanese culinary story of adopting an ingredient from abroad, adapting it to meet the Japanese cooking prerequisites of having an enticing aroma, attractive color, and balanced, naturalistic taste, and then assimilating the perfected ingredient into the country’s unique cuisine. The process of transforming soy sauce into a Japanese foodstuff took about 1,000 years. It started with the introduction from China of something called hishio—an early form of miso—around the 5th century. Made from steamed soy beans, salt, and water and fermented for about six months, hishio was a paste served as a condiment. The paste was delicious for reasons that may not have been well understood at the time. Soy beans are one of the best sources of plant-based protein, and their high level of natural umami is intensified when bonded with salt. Fermenting the mixture of soy beans and salt further strengthened the umami in hishio. Over time, the liquid that pooled on top of the hishio paste was also found to be tasty and useful, and it began to be appreciated as a cheap, liquid form of salt that had a hidden richness. At first, the liquid was mainly used to preserve and pickle foods. Gradually it came to be used more broadly by Japan’s rapidly growing population, especially by those who were willing to put up with its “beany” smell and pungent flavor because they could not afford more expensive pure salt. By the late 13th century, this salty liquid began to be brewed for itself and called tamari (たまり), increasingly used as much for its umami as for its saltiness. Around 1600, there was a breakthrough in the small town of Yuasa in Wakayama prefecture, and, seemingly overnight, tamari was transformed into Japanese soy sauce, or shoyu (醤油). This happened through four innovations. The first was the addition of wheat in an amount equal to the soy beans. The fermentation of the wheat introduced liquor-like qualities, improving soy sauce’s aroma with a fruity fragrance, adding sweetness to balance its saltiness, giving it a new acidic brightness, and thinning its texture. In addition, before being added to the mash, the wheat was roasted, which increased the umami in the final product. The second innovation was the use of large wooden barrels, called kioke, in which to brew soy sauce. (Tamari was made in small clay pots.) The grain of the wood barrels harbors millions of beneficial microbes that deepen the umami of soy sauce and add unique flavors. The size of the barrels was also a positive factor, as it reduced and helped to better regulate soy sauce’s exposure to air, enabling a long, slow fermentation and aging. (Very small-batch soy sauce, like that made at home, has off smells and a raw taste because the soy sauce is exposed to too much air, too fast; it tends to smell and taste like something that has spoiled.) The third innovation was lengthening the brewing time to at least two summers—the most active time during which fermentation occurs—to give soy sauce deep, multiple layers of umami. A corresponding aging of the soy sauce further enriched and also mellowed its flavor. The last innovation was pasteurization. Pasteurization stabilized the quality of soy sauce; it also refined its flavor and gave its umami a long finish. The new Japanese soy sauce was an instant success, and within a hundred years became the most popular seasoning in Japan. From the beginning, brewing soy sauce was a big business. In the 17th century, Shodoshima Island became a brewing center with hundreds of breweries shipping their product to other parts of the country. Soon breweries north of Tokyo eclipsed it in scale. (Soy sauce has always been a more popular seasoning in cold, northern Japan partly because the region cannot easily produce natural sea salt.) Driven by demand and profits, soy sauce breweries cropped up everywhere in the country because they provided a comfortable life for their brewers. This included informal government support due to soy sauce’s fundamental importance to society. 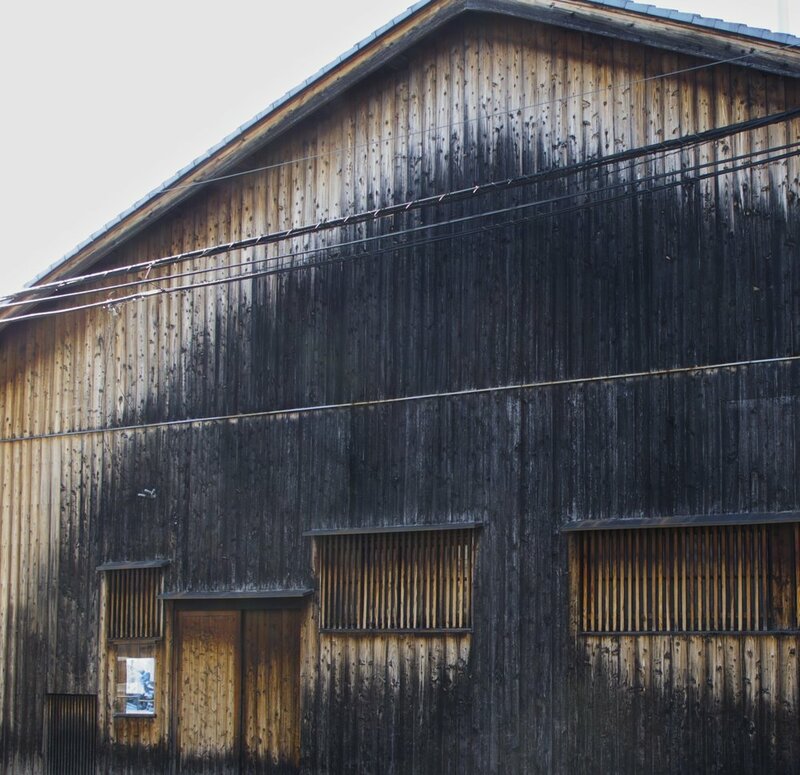 For example, during World War II the buildings around soy sauce breweries were razed to create a break that would protect the breweries from fires caused by Allied bombing. By the late 20th century, there were 6,000 soy sauce breweries in Japan. Even in the industry’s early days, the quality of soy sauce was uneven as brewers used inferior ingredients and took short cuts in the process to compete and make money. The deterioration worsened in the 20th century as competition intensified. Instead of whole soy beans, brewers began using cheap soy meal imported from abroad, which had been denatured of its nutritious and flavorful oil. Massive steel tanks replaced the kioke wooden barrels. Brewing times were shortened to a year and less. To compensate for the shortcomings in flavor these shortcuts caused, caramel coloring, corn syrup, and chemical preservatives were added, and maybe worst of all, artificial MSG was injected to give the soy sauce an umami boost. A process was even developed to make a completely synthetic soy sauce in a single day. To be fair to the industry, it was not just the brewers who drove the deterioration in the quality of soy sauce. Cooks and consumers also played a role by over-using and mis-using it. Soy sauce’s umami is forceful, and soy sauce is used too often for its hit of intense, protein-rich umami flavor and ability to make any dish a comforting pleasure, and not for its subtle seasoning abilities. Early on, soy sauce replaced the traditional use of salt and citrus as the means to season sashimi and sushi. During the Edo period (1603-1868), numerous recipes were created based on it, including such classics of the Japanese culinary canon as sukiyaki, teriyaki, and nimono—all umami-laden dishes that taste more of soy sauce than their ingredients. In the 20th century, soy sauce became a fast-food seasoning used by professionals and home cooks to make everything taste good—poor ingredients, overly simple recipes, and lazy cooking. Consumers were happy to buy soy sauce in large quantities—often in some kind of PET bottle—and they wanted it cheap. A wake-up call to the industry came toward the end of the century as soy sauce’s use started to decline due to several trends. These included a growing preference for cooking with healthy, natural seasonings and making lighter tasting, better seasoned dishes. This has inspired a renewal of Japan’s native forms of seasonings—sea salt and citrus. Another trend has been greater competition from other well-made, umami-enriched seasonings such as moshio seaweed salt, dashi stock, sake, and rice vinegar, all of which have heightened levels of umami by being made naturally and artisanally. Lastly, Japan's cuisine is currently amidst a multi-century assimilation of Western foods, and the growing use of the umami-rich ingredients of olive oil, butter, cheese, stocks, tomatoes, wine, and meats is diminishing the role of soy sauce. Whole, full-fat soy beans, called marudaizu, are steamed and mixed with an equal volume of roasted wheat in pans. The soy beans and wheat are grown domestically. Koji mold spores (green Aspergillus oryzae or Aspergillus soyae) are sprinkled on the soy bean and wheat mixture and left to germinate at carefully controlled temperatures for about three days to create soy sauce koji. 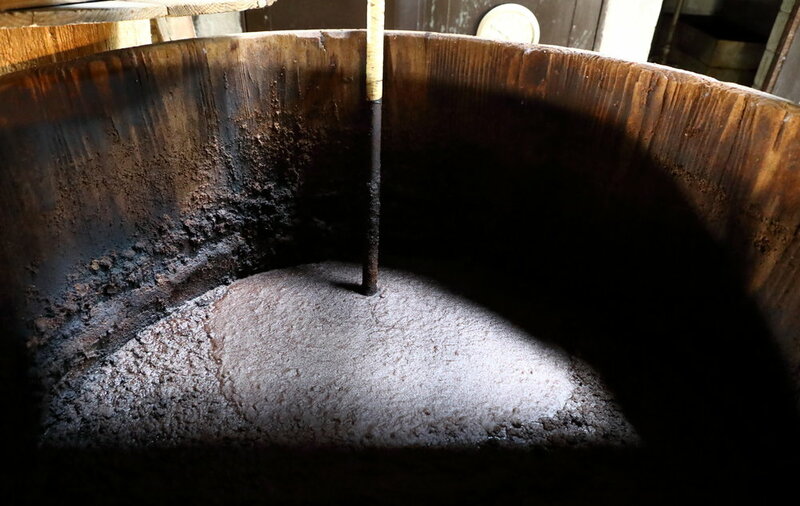 The soy sauce koji is blended with water and sea salt in kioke wooden barrels. The mash, called moromi, is fermented and aged for at least two summers. Raw soy sauce is pressed from the moromi and pasteurized quickly at low temperatures. The brewing process is carried out mostly by hand and entirely in-house. It is estimated that there are around 100 brewers who meet these standards. Most of them are old, family-run businesses that are continuing ancient traditions or have changed their methods to brew better soy sauce. Typically, they are small operations, with all the work done by family members and possibly a few other staff. By pursuing quality and creatively taking advantage of the many possible variations in the ingredients and processes within the honjozo true brewing method, they are making some of the best and most interesting soy sauce that has ever been made in Japan. Great soy sauce starts with the ingredients. Artisanal brewers are using new, protein-rich soy bean and gluten-rich (gluten is high in umami) wheat hybrids, uniquely flavored heirlooms, and organically grown soy beans and wheat to deepen the umami-richness of their soy sauces and create unique tastes of place. Whole marudaizu soy beans are the foundation of soy sauce’s umami. Two leading hybrids are Enrei and Fukuyutaka, both of which are sweet, creamy, buttery types of soy beans. Increasingly, brewers are using Japan’s over 300 varieties of heirloom soy beans. They have diverse shapes and colors and tend to be more aromatic and have stronger flavors than the hybrids. One variety, black soy beans, are richer and more nutritious than many other types of soy beans. While most artisanal brewers use mature yellow soy beans, some are using fruitier, not fully ripened green soy beans. The wheat used is typically a high-quality, locally-grown grain. As is true for many of Japan's great fermented food products, the character of the water is important. In the case of soy sauce, mineral-rich, hard water aids fermentation, adds flavors, and helps create a clean, crisp soy sauce. Soft water results in a creamier soy sauce with more complex fragrances and flavors. All artisanal brewers use natural sea salt to make their soy sauce. This includes moshio seaweed salts, which are sea salts enriched with umami because they incorporate bits of fermented seaweed. In addition to providing another layer of umami, moshio seaweed salts help round out soy sauce’s flavor and add valuable nutrients and minerals. Soy sauce koji is the base ingredient of soy sauce. It has a greenish-brown color, smells like melons, and tastes like candy. There are even more possible variations in the process, including how long and at what temperature the soy beans are steamed and the way the wheat is cracked and roasted. Some artisanal brewers still roast the wheat over an open fire, as was traditionally done, giving their soy sauce a smoky accent. As the base mixture of soy sauce, the koji greatly influences the final product. This includes the type of koji mold used to develop it and whether brewers shorten its fermenting time from the standard three days to two days to create a more robust koji or extend it to four days to create a more mellow one. Soy sauce making starts each year in late fall-early winter, and after fermenting it over two summers, is completed in 18 to 24 months. The longer the process, the richer and mellower the soy sauce. Modern pressing and cooling equipment is helping brewers make purer soy sauces and more intensely flavored ones. When pressing, there is a difference between pressing some or all of the moromi as it affects how much oil and sediment are retained in the soy sauce, which create deeper, fuller-bodied flavors. Instead of pressing, some brewers still use the traditional method of dripping soy sauce from the moromi through canvas bags. Soy sauce from the first, middle, and last parts of the drip all have different flavors, as does the flavor of a whole drip of the moromi. Cooling equipment helps brewers preserve the flavor of the more delicate, refined soy sauces. It has also inspired them to make unpasteurized versions of their soy sauce, which offer an intense upfront hit of umami and no finish. The revival of the use of kioke wooden barrels has been fundamentally important to brewing great new kinds of artisanal soy sauce because the millions of microbes—bacteria and yeasts—harbored in their wood grains have a big influence on soy sauce's depth of umami and also add to its taste. These microbes also exist in the buildings of the old family breweries. There typically are over 300 different kinds of spores in a soy sauce brewery, each adding its own particular flavor and function to the fermentation process. But the spores can also be managed by how the barrels and buildings are maintained and the degree to which the moromi is exposed to air during fermentation. Sheets of moromi solids are all that are left after soy sauce has been pressed. Lastly, artisanal brewers are tinkering with the basic recipe and process to further diversify the flavor and functionality of soy sauce, creating a variety of specialty products. While artisanal soy sauce is very much a product of the brewer and nature working together, the unique and nuanced flavors of the final product are ultimately a reflection of the skills and intentions of the brewers, which can include preserving traditions, creating the deepest, richest umami, meeting the needs of regional cuisines or modern tastes and cooking styles, and producing soy sauce that is ethical and sustainable. Classic—A rich medium- to full-bodied soy sauce with deep, multi-layered umami and a slight bitterness (akin to that of dark chocolate.) The aroma is savory and appetizing, and the color is dark, almost black. Typically, the brewer intervenes as little as possible, following the traditional basic recipe and letting nature and the power of fermentation do the work of creating great soy sauce. The brewer’s influence is largely in the selection of high-quality soy beans and wheat that will fortify the intensity of the umami. Higher levels of oils, sediment, and liquor that tend to be produced during the process give it a long finish and also makes this the “meatiest” style of soy sauce. Classic soy sauce is good for caramelizing grilled foods and roasting vegetables and for long cooking, as a base for other sauces, for layering with other types of umami-rich ingredients, and for classic Japanese recipes and when an Asian flavor is desired. It can be used as a condiment or finishing sauce for rich red-fleshed seafood, tofu, meats, and other strong-tasting foods and in heavy desserts. Refined—A thinner, light- to medium-bodied soy sauce with greater sweetness and an overall more rounded flavor. Aromas are expressive, often ethereal, and include floral and toasty as well as fruity notes. The color is lighter, revealing more of the red hues of soy sauce. Also made with best-in-class ingredients, refined soy sauce reflects an active role by the brewer who applies special techniques for one or more steps of the process, including koji-making, fermenting, and pressing the soy sauce. Refined soy sauce is good for light, tender foods like flaky white fish, chicken, and pork, spring and early summer vegetables, salad dressings, fruits, and light desserts. It pairs well with light forms of umami such as olive oil, fresh cheeses, tomatoes, and garlic, making it a good seasoning for Italian and French Mediterranean food. Because refined soy sauce skews flavor to a lesser degree than classic soy sauce, it is good for all types of fresh, seasonal-ingredient-oriented cooking. Farmhouse—A pungent, usually medium-bodied soy sauce with a wild flavor due to a higher level of acidity. The aroma is fruity and the color brownish-purple. Farmhouse soy sauce is a product of its environment—locally-grown beans and wheat, natural untreated water from wells, springs and streams, and high exposure to the bacteria and yeasts in the air during fermentation. Farmhouse soy sauces are made with the same care and craftsmanship as the other soy sauces and reflect the passion of the brewer to create unique tastes of place. Farmhouse soy sauce is good with rich and spicy foods and gamy meats because of its higher acidity and wild flavor. Its brightness is useful for anything that needs both an umami boost and some zip, like bean and vegetable soups, stews, chili, and barbeque sauces. Because farmhouse style soy sauce is often made with organically-grown soy beans and wheat, often grown by the brewers themselves, it is a good option for cooks concerned about the ethical qualities and sustainability of the ingredients they use. Specialty—There is a broad range of artisanal specialty soy sauces. They include well-made versions of standard regional variations such as soy sauce with added sugar to increase its sweetness for use in the cuisines of western Japan or added alcohol to better pair with the fermented foods and gamy meats of Japan’s mountainous regions. Artisanal breweries on Shikoku Island are using ancient types of barley (o-mugi) instead of wheat (ko-mugi) to give a malty character to their soy sauce and renew the food heritage of one of Japan’s oldest settled regions. Sawai Soy Sauce, the last artisanal soy sauce brewer in Kyoto, leaves some of the moromi in its famously rich, long-aged soy sauce to add chewiness and deepen and extend its flavor. Naogen Soy Sauce in Kanazawa, a city that prides itself on being the center of Japan’s fermented food culture, has created a crystalized soy sauce whose intense umami and unique texture make it one of the purest forms of umami with wide applications. Artisanal brewers typically make two core products: a soy sauce designed for cooking and another for finishing foods. The cooking soy sauce is a sturdy version of the brewer’s style, made to stand up to heat and extended cooking. Finishing soy sauces are the brewer’s art—the soy sauce that fully reveals the flavor of their style and their unique variation of it. For example, Tanakaya’s finishing sauce, labelled “Premium,” is a purer, lighter, beautifully balanced version of its refined style of soy sauce. It achieves this by capturing only the first drip of soy sauce from the moromi. The cooking version is a whole drip. Yamaroku Soy Sauce’s finishing sauce “Tsuru-bishio” takes the brewery's richly fermented classic style of soy sauce to new depths of flavor by being brewed for four years instead of two for its cooking version. Katakami Soy Sauce uses fruity green soy beans for its finishing soy sauce, better enabling its farmhouse style of soy sauce to pair with its region's hearty, game-oriented cuisine. Often, a brewer’s finishing soy sauce is an unpasteurized version, called nama-joyu or ki-joyu, providing a strong, immediate hit of flavor of its house style. (Unpasteurized soy sauce is also called nama-age and ki-age.) Another variation is nigori, or cloudy soy sauce, which is not as finely filtered, leaving some of the sediment and giving a deep, fully flavored version of the house style and flavor. Finishing soy sauces are meant to be used in dressings and as sauces for cold and warm dishes, and, above all, as a dipping sauce and topping for foods. Cooking soy sauces can also be used at the table, depending on what kind of flavor is desired. Brewers do not label their soy sauce as cooking or finishing. The finishing soy sauce is obvious because it has special qualities that would be lost in cooking. A good indication of a finishing soy sauce is the brewer’s instructions not to use a particular soy sauce for cooking or to keep it in the refrigerator. A new type of soy sauce dish (shoyu-zara) is being made to help people better use and appreciate artisanal Japanese soy sauce when finishing foods at the table. Coming in a variety of shapes and sizes, they are designed like the ink stones used in calligraphy and have a small reservoir and sloped sides. The large round dishes on the diagonal in the photo above are examples. The shallow reservoir helps prevent people from pouring too much soy sauce, while the sloped sides help limit its use. The sloped sides also enable one to better see the soy sauce’s beautiful colors. These dishes are also convenient chopstick rests. Four different styles of artisanal Japanese finishing soy sauce fill the dishes in the photo. At the top of the diagonal is Tanakaya’s rich red, refined “Premium” first drip soy sauce. In the middle is Katakami’s purple-colored, farmhouse finishing soy sauce made with fruity green soy beans. At the bottom is Yamaroku’s classic deep, dark “Tsuru-bishio” soy sauce, which is fermented and aged for four years. In the small dish in the upper right hand corner is Naogen’s specialty crystalized soy sauce and in the bottom left hand corner Sawai’s specialty chunky soy sauce. Sawai Shoyu’s deep, dark, long-aged soy sauce so perfectly captures the richness of the earth that it is simply bottled as is, providing a chunky type of soy sauce. The brewery also offers a pressed liquid version. Soy sauce is called shoyu (醤油) in Japanese. The standard for Japanese soy sauce is koikuchi (濃口), which means “rich taste.” During the Edo period (1603-1868), soy sauce was colloquially called murasaki (purple) because of its noble purple color. Today it is mainly chefs at high-end sushi and kaiseki restaurants who still refer to soy sauce as murasaki. Artisanal soy sauce brewers typically make a variety of soy sauce-based blended products, the range of which depends on their size and role in their local market. The most common and interesting ones are several sauces designed to broaden soy sauce’s usefulness by heightening certain key seasoning capabilities. Dashi-joyu, Tsuyu, or Tosa—soy sauce blended with dashi stock to lighten its umami blend and increase its saltiness. As a mix of Japan’s primary land and sea umami seasonings, it is a convenient pre-mix for cooking many types of Japanese dishes and is used to make soup stocks and broths, dipping sauces and dressings, and as a topping for sashimi, sushi, and tofu. Ponzu—soy sauce mixed with tart citrus juice to create an acidic, umami blend. Combining the two seasonings that most stimulate the appetite—acid and umami—makes this an irresistibly tasty and refreshing sauce that can be used for practically anything—dipping sauces, dressing, glazes, marinades, sautés and stir fries, soups, stews, braised dishes, and hot pots. Saishikomi or Kanro—soy sauce that has been double-brewed to heighten its umami and sweetness and also give it a more viscous texture. It is made by combining a fermented batch of soy sauce with a fresh set of ingredients and then re-fermenting the mixture again for a total of at least three years. It is commonly used on sashimi (especially rich seafood), meats, and other heavy foods including desserts. It can be thought of as a well-made Japanese version of a Chinese type of soy sauce—dark, thick, rich, and sweet—useful in Chinese and other Asian cooking. Shiro-joyu—an almost clear or "white” soy sauce made almost entirely with wheat and fermented for only six months. Sweet and alcoholic, it is like a light wheat liquor with doses of salt and umami. Tamari— the “beany,” unbalanced, strong flavored precursor to soy sauce. Its main attraction is that its gluten-free because it is not made with wheat (but check the label to be sure). Tare, Tomato, or BBQ sauce—soy sauce mixed with combinations of sugar, citrus juice, vinegar, spices, peppers, and, often, tomatoes to create a thick sauce with zip, exotic flavors, heat, and a Western-form of umami. This blend varies a lot by brewer and can be similar to ketchup, brown sauce, chili sauce, or BBQ sauce, and used in similar ways. Artisanal brewers may also make other types of blends as well as miso. If you like the house style and flavor, all of these products are worth trying. In recent years, commercial soy sauce brewers have created low-salt soy sauce whereby some of the salt is removed from the soy sauce post-brewing. This sauce is a mechanical and chemical aberration that is best not considered. Just use less soy sauce. Or even better, learn how to correctly use soy sauce. From the top of the soy bean shaped dish: Katakami’s dashi-joyu, Tanakaya’s lime ponzu, and Okamoto’s saishikomi soy sauce. In the small round dish is Yamaroku’s tomato sauce. A little goes a long way. Season in drops, spritzes, splashes, and teaspoons. A tablespoon should be enough for most soups, stews, braised dishes, roasts, and meatloafs. As you near using two tablespoons of soy sauce for anything, warning bells should go off. In general, add soy sauce toward the end of cooking to preserve the subtle qualities of its flavor and the full force of its umami. For long-cooked dishes, earlier is okay but make sure you use a cooking soy sauce. Keep in mind that soy sauce is also salty, sweet, acidic, and bitter. It can be an all-purpose seasoning, but if you are using sugar, salt, and acid in a dish, add soy sauce after them. By seasoning in this order, you are likely to need less soy sauce and will also have a well-seasoned dish. The salt content of artisanal soy sauce is lower than you might think. The enbun, or salt ratio of artisanal soy sauce, is around 15-18% salt in cooking soy sauce and a bit less for most finishing soy sauce. This means that there is about 1/5 or less of a teaspoon of salt in a teaspoon of soy sauce and just about 1/2 of a teaspoon of salt in a tablespoon of soy sauce. This leaves plenty of room for other salty seasonings in most dishes. When using artisanal soy sauce, focus on it being an addition of umami, not salt. Consider the umami of the other ingredients in your dish. There can be too much umami and you will lose the freshness and flavor of your ingredients. Match the strength of the flavor of your dish with an equal intensity of umami to maintain the overall balance of the dish. The strength of the flavor of the dish reflects its ingredients and cooking technique. The intensity of the umami reflects the style of artisanal soy sauce and the amount used. For example, fresh, delicate vegetables and seafood lightly cooked need only a low level of umami. Heavy, rich, meaty and long-cooked and roasted dishes are likely to need more soy sauce or a deep, rich style of soy sauce. Again, remember that “less is more.” Be wary of recipes that call for anything over two tablespoons of soy sauce. Such recipes give dishes an Asian taste. They also tend to be recipes designed for last century’s cooks who wanted a short cut to create fast comfort food. Although artisanal soy sauce can be kept in the pantry at room temperature even after opening because it is a fermented and pasteurized food, it is better to refrigerate it to maintain its freshness and nuanced flavor. As soy sauce deteriorates it becomes more acidic and unbalanced in flavor. (If that happens, use it for cooking.) Because of the delicate qualities of a refined style of soy sauce, it should always be refrigerated. This is also true for all unpasteurized soy sauce. Given the small bottle sizes of artisanal Japanese soy sauce, the different types of applications that are available, and the reasonable prices for such a finely-crafted product, buy a variety of styles and brewers and experiment to see which styles and types help you cook better. You should at least have one cooking soy sauce and one finishing type in your pantry. The shop at the entrance to Okamoto Shoyu, an artisanal brewer of a medium-boded classic style of soy sauce on Osaki-kamijima Island in the Seto Inland Sea. Its finishing soy sauce is unpasteurized nama-joyu, kept in the small white refrigerator on the right end of the upper shelf. A good sign that you have come across an artisanal soy sauce brewer during your travels in Japan's countryside is an informal shop at the entrance to the brewery. There should also be an appetizing aroma of brewing soy sauce floating through the neighborhood, especially in the summer months. To be sure you have found an artisanal brewery, ask to peek into the brewery to see the kioke wood barrels. Most artisanal brewers are happy to oblige, being passionate and proud of what they do, and more than likely will give you a full tour of their brewery even if you do not understand a word of Japanese. A number of breweries also offer hands-on demonstrations to small groups upon reservation. Artisanal brewers also sell their soy sauce online through their websites, but these tend to be in Japanese and require local order fulfillment. Their products can also be found in local food stores and at the prefectural antenna shops in Tokyo. More and more, department stores in Japan's major cities, as well as a growing number of stores specializing in fermented food products, have a good selection of artisanal soy sauce. Artisanal soy sauce is very reasonably priced considering its quality and the time and skill to make it. Most small 100-200 milliliter bottles are priced between ¥600 and ¥1,000. Artisanal brewers also offer larger-sized bottles, typically at even better prices.